For burst after burst of uplifting fragrance. A fabulous fusion of five fragrant herbs. Brilliantly clean laundry every time. Convenient and easy to use. Also available in liquid. fresh smell to your clothes.Surf Freshness of 5 Herbal Extracts is a fusion of five gloriously fragrant herbs: soothing lavender, invigorating eucalyptus, healing tea tree, refreshing pine and cooling mint. Together, they infuse your wash with a perfect spring-like fragrance reminiscent of warm sunny pastures and light, caressing breezes. 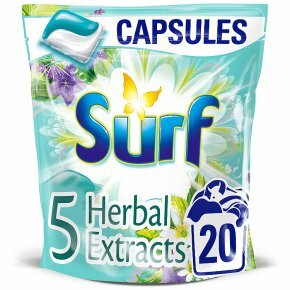 Surf Freshness of 5 Herbal Extracts with its fresh spring fragrance is available in washing liquid, washing powder and washing capsules and is suitable for washing both colours and whites. Surf's laundry range brings you the joy of fragrance, long after you've washed your clothes. With burst after burst of uplifting fragrance released right through your day, your laundry stays fragrantly fresh, with a brilliant deep clean you'll love. Surf capsules are extremely easy to use, efficient and convenient for your busy life. Simply pop a single capsule at the back of your washing machine's drum, add your laundry and enjoy the great results of brilliant cleaning and excellent fragrance. For the best results, use one capsule for standard soiling, soft/medium water and a standard load (3-5kg). Use two capsules for heavy soiling, hard water or a larger load (6-8kg). Top Tip: If you notice residue from the laundry capsule on any items of clothing, do not place them in the tumble dryer. If the residue is not rinsed out of the fabric before drying, this could cause permanent staining.